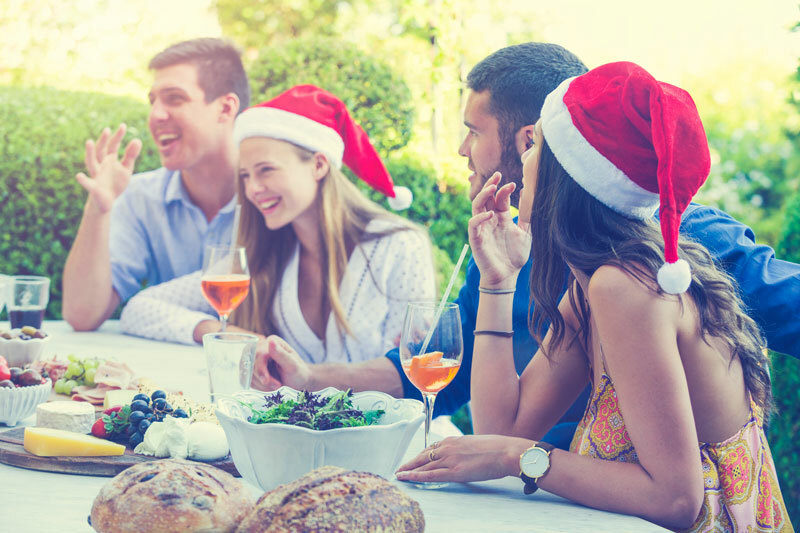 If you’re the one who usually hosts Christmas in your family, then you’ll be all too aware of the time, stress and expense involved. While Christmas is all about giving, it’s usually the person asking if anyone would like more turkey who is giving the most. Well, this mum has come up with a rather cheeky solution to being the hostess with the mostest at Christmas, and the internet is divided. Pregnant mum of four, Gemma Andrews, has been the go-to host in her family for over 10 years. That’s 10 years of buying Christmas hams (and maybe a second fridge), making fiddly appetisers, various salads and sides, decking the halls with holly, roasting turkey, not forgetting the bon-bons or who can’t eats nuts, making sure there are enough chairs for everyone and if not buying a few more, spending up on drinks and stressing over whether the pavlova peaks are stiff enough. And that’s only some of it. While other families may ease the cooking burden on their Christmas Day host by all bringing a plate, poor Gemma is forced to control the cooking in her family. She has a son who is highly allergic and as she says, she “doesn’t trust them” to adhere to her son’s strict ‘no this or that’ dietary requirements. This means Gemma cooks EVERYTHING, and spends her own hard earned cash buying all the ingredients. Gemma appeared on the popular British television show This Morning and discussed her controversial idea of charging family members £30 (around $50 Australian dollars) for a seat at her Christmas table – which usually consists of around 16 adults and a bunch of kids. She explained that little Christmas goers are excluded from the charge with the adult ticket price covering their share of Gemma’s hard work. While the internet has taken great joy (as it does) in slamming Gemma for being a Christmas Scrooge and “going against the spirit of Christmas” her family couldn’t care less. Gemma says they are actually relieved not to have the stress of Christmas hosting and feel good that they are able to give back to Gemma for taking it all on – every year. What’s more, Gemma reveals it was actually her kids’ grandparents on her ex husband’s side (yes, she still includes them in her Christmas) who suggested it. While $50 a head may seem a bit much, Gemma swears it all goes on covering the costs of the day – mostly food and alcohol but also all the peripheral stuff. The Christmas host said she tried for many years to keep the cost down by asking family members to bring a plate or charging them less, but neither of which really covered things or worked out. This way Gemma isn’t out of pocket, her family all feel great about that and can just enjoy Christmas Day without feeling guilty. As for why no one else puts their hand up for Christmas, Gemma says she has the right house for the occasion, and we all know within our own families that there is always someone who has that perfect house for Christmas. That, and she feels she needs to be in charge of the cooking because of her son’s allergies. Would you charge your friends and family for Christmas dinner? Overwhelmingly, most respondents clearly felt it was wrong to do so with only 10 per cent saying ‘yes’ to the question and the other 90 per cent saying ‘no’. The controversial chat continued after the show on the inter webs with some people accusing Gemma of being greedy and in blatant defiance of what Christmas is all about – giving. While others meanwhile felt she was being sensible. “Hosting Christmas for 16 would cost a fortune. Asking for money is no different to people than bringing a few dishes and bottles of drink. If they’re all happy with the arrangement, then that’s all that matters,” said one Twitter user. Whether her request is on the money or out of line, one thing is for is for sure, hosting Christmas is a big job and one we are all thankful doesn’t fall on our shoulders every year. Unless you are also like Gemma and in which case, is this such a crazy idea?